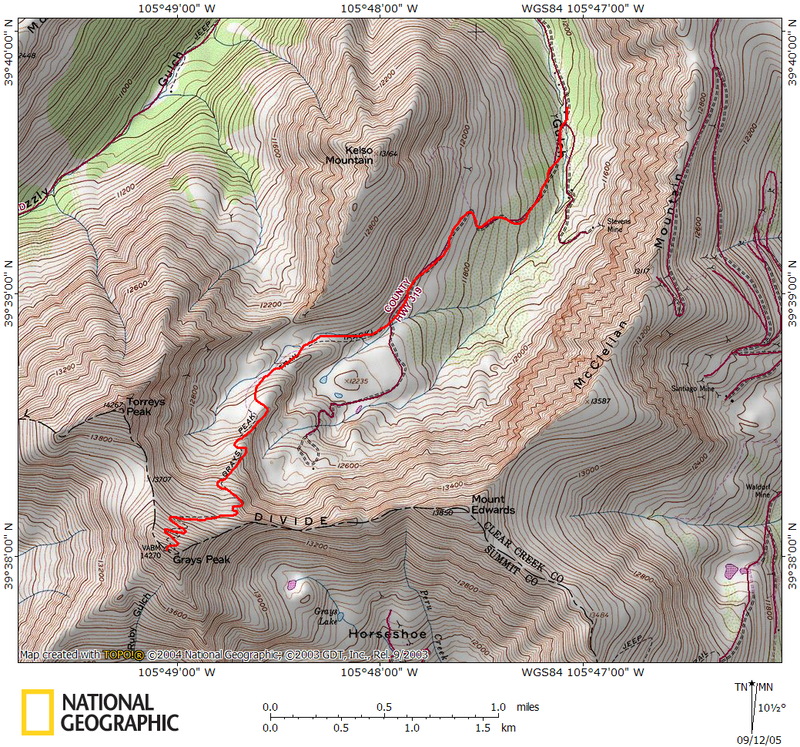 Note: Grays Peak doesn't need much of a trip report - it's a very straightforward hike with a well established trail all the way to the top. Since this was my first 14er, and on this occasion, Brenda's first 14er, I thought it would do well to document how their trip progressed, and how they handled the conditions - not because I feel like denigrating my friends on the internet, but simply because I believe this is an accurate representation of what a hiker can expect on their first 14er. I believe Brenda and Ryan are about in the same shape as most people, and so their experience is fairly standard. A few friends of mine wanted to do a 14er. Brenda had never done one before, and Ryan had done Mt. Bierstadt about 7 years ago. I was trying to think of good starter peaks to take these two friends of mine up. Quandary would've been okay, except it gets a little rugged near the top, and it's a little steeper than other peaks; Bierstadt is great, but Ryan had already hiked it; Lincoln, Democrat, and Bross all are a bit steep (and seem to be undergoing a bit of a private property issue); Mt. Sherman's pretty easy, but rather undramatic for a summit and a hike, which left Grays and Torreys Peak (everything else was either non-novice or too far away). Well, Torreys Peak is a bit more of a push than Grays Peak was, so Grays it was! This was fitting to me, as Grays was my first 14er too in 2003! Once the peak was chosen, the next challenge was getting there. I'd done Grays and Torreys on separate trips, so I'd been to the trailhead twice before and remember fondly the road leading up to it. While I probably could take my Honda Accord up the road, I'd really prefer not too, as it was deeply rutted, potholed, and rocky (although, it was in better condition than I remember). I used my wife's Toyota Tacoma and piled my friends in the cab (which seats 2, sort of...) to head up the road from the Bakerville exit (Exit 221 off I-70). While I was comfortably cruising (well bouncing, really) in the truck, a BMW 3 Series was cruising ahead of me, and a Volkswagen Jetta was in front of him; needless to say, a high clearance vehicle isn't necessary for this road, but I'd recommend it if you respect the undercarriage of your sedan. (Speaking with the sedan drivers at the trailhead, they indicated that they scraped a bit). The Grays and Torreys trailhead from Stevens Gulch is surprisingly nice, given its rugged approach road. It has a well maintained pit toilet and a reasonable parking area (which fills quickly on weekends, as these peaks are popular! I read in John Fielder's Colorado 1870-2000 II book that nearly 20,000 people climb Grays Peak every summer!). The trailhead sits right at treeline. We started our hike in the shade of the long ridge of McClellan Mountain to our east around 8:00am. The trail begins by crossing a bridge from the trailhead, then gently ascending up a very solid trail. Grays and Torreys were, at first, not visible from the trailhead. After a few minutes of hiking, Grays slowly crept into view, then it was again blocked by Kelso Mountain, until both Grays and Torreys emerged, forming a massive block at the end of the gulch. After about a mile, we'd gained around 700 feet - a nice warm-up to the hike ahead. At this point, we reached a large sign, indicating exactly where we were in the nation (which we found incredibly useful. For awhile, I started thinking we were in Kentucky, thankfully the sign set me straight!) Of course, since we were on the Continental Divide Trail, I suppose the sign did have its use. We stopped for a few minutes at the sign for photos and for everyone to catch their breath a bit. Brenda was already breathing a little hard, seeing as how we were at 11,900 feet, but Ryan seemed to be taking the altitude pretty well. We continued hiking up the trail as it steepened a bit, ascending above the willows that had surrounded us. We took another lengthy break at 12,350' for some food and oxygen. Both Ryan and Brenda were feeling the thinner air by now, and our pace had slowed significantly. As we snacked on the side of the trail, a large number of hikers passed us ascending, a few stopped and caught their breath as well. We were stopped right at the spur trail leading to the Kelso Ridge approach up Torreys Peak (a Class 3-4 ridge with a bit of exposure), and two hikers broke off in that direction. Unlike the more deserted mountains found in the southern Sawatch, the trail had lots of other hikers on it. I'm guessing we easily saw over one hundred people along the trail, so don't hike Grays during the weekend expecting any sort of solitude. We saddled up again, and continue our ascent. The higher we got, the more rugged the terrain became. We snaked up and around a large talus pile which was topped with green tundra. The tundra gave way to a more rocky section around 13,000', where the trail weaves in between the talus. While this bit of trail will slow you down a touch, it's still very solid and stable trail. As we emerged from the larger rocky section (the most rugged part of the trail), we took a break yet again on a tundra covered "step". Our stops were becoming more frequent now, as the air was thinner and the grade was gradually increasing. It was here that we spotted a mountain goat across the cirque on the cliffs below Torreys peak. It was a faint grayish speck, but it moved (which is how we knew it wasn't a rock). We snapped a few photos (which, of course, look remarkably like a speck) and moved on. Not too much farther up the trail, the grade became even steeper, and the tundra disappeared entirely, giving way to the rocky slope leading up to the summit of Grays. We encountered a sign indicating the splitoff trail that led to the saddle between Grays and Torreys (and continued on to Torreys Peak). Our pace had slowed considerably, as my friends were become more fatigued and the air continued to thin. We established a goal of moving about 100 vertical feet at a time, then taking a break (a technique I've found to help ensure you continue to gain ground even if your slogging up a terrible slope). This tended to work, however my friends tended to give up after around 75 feet or so (oh well...close enough). As we hiked, we continued to encountered a few other hikers also conquering their first 14er as well - their pace wasn't much faster than ours. The route gradually switchbacked its way up towards the summit through the scree and talus, with a very solid trail all the way to the top. Finally, we crested the summit at about 12:35pm. It had taken us about 4.5 hours to gain the summit - a little slow, but still a respectable time for a first 14er. Normally, this time would make me a bit uncomfortable, owing to the axiom that storms typically come in the afternoon, but since the sky was clear and I was hiking with someone getting their PhD in Atmospheric Science (Brenda), I figured we were okay. As the sky was incredibly clear for miles, we lingered on the summit for about forty minutes. The summit had maybe twenty people up top, which is not too crowded for Grays. We snacked on jerky, trail mix, and goldfish crackers, as well as drinking lots of water (which I'd been reminding Ryan and Brenda to do the entire hike). Both struggled a bit to get to the top, but they made it, and the selective amnesia of peak bagging began: you forget all of the pain you had to endure to make it to the top as you take in the view; then, as you descend, you even start to think about hiking again (even after you swore you'd never hike again on the way up). We began our descent at a pretty good clip. Of course, as you descend, lack of air is no longer a problem, as your body is not working as hard, but joint and leg pain starts to become an issue. Our pace slowed as we descended, and we ended up taking frequent breaks to rest our legs and feet, as well as enjoy the afternoon. As we descended, we encountered a goat head on - he was simply standing in the middle of the trail, licking some spilt liquid. He didn't at all seem to mind that we were 10 feet away from him (I'm sure they're fairly used to humans along this trail), so we moved in closer for a picture. He finally skittered away when I was nearly 2 feet from him, but he didn't go far. Once we departed from the area he was snacking on, he promptly returned to continue licking. Once we were back on the valley floor, it was obvious that a late afternoon storm was building over the ridge. Clouds were building and darkening, but since we were close the car, we were not too concerned. We finally made it back to the car at about 4:00pm, giving us a descent time of about 3 hours. A number of cars were still at the trailhead, so there was obviously still a large number of hikers on the peaks. Brenda and Ryan had done great - though they were certainly sore and tired now. We took a few minutes to stretch (a painful lesson to forget), piled in the truck, and headed back down the road, feasting on an early dinner at the Buffalo Restaurant in Idaho Springs.